Straight from the workbench, a delicate bridal hair vine inspired by the beautiful tones of dusk. This piece was lovingly designed for bride Jessica in warm and inviting tones of silver, rose gold and blush. We adore this colour palette because it’s equal parts romantic, chic and feminine. 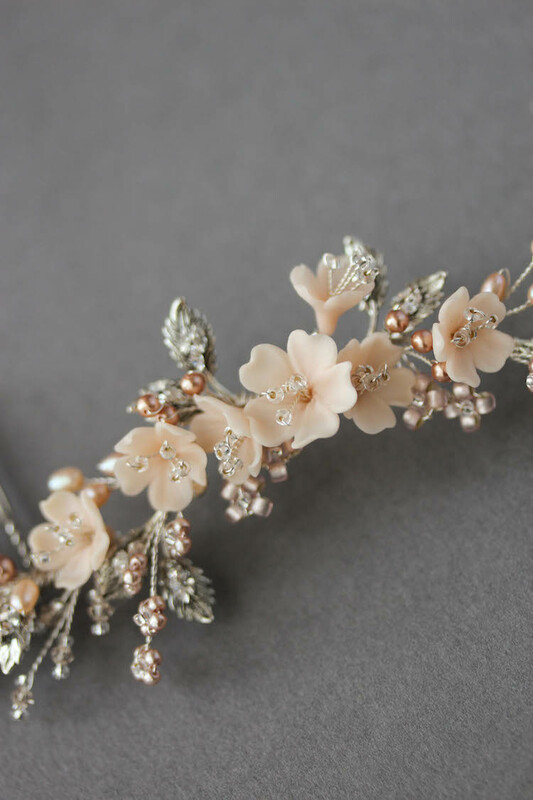 In designing Jessica’s bridal hair vine, we drew inspiration from the TEAROSE hair pin. Jessica loved the details and colours of this piece but preferred a longer length and style to suit her bridal hairstyle. So we lengthened her piece by double and redesigned the layout to better suit the symmetry of her hairstyle. This beautiful piece is designed to be worn in the centre back of her head with a veil. We love the simplicity of this hair vine and the organic nature of its elements. It would perfectly suit lace wedding gowns, structured modern gowns or soft and flowing silhouettes. The beauty of TEAROSE is in its feminine design, delicate details and beautiful colour combinations. This beautiful piece for Jessica would also work beautifully in silver/ivory, gold/ivory and gold blush tones. If there’s a colour combination not listed above, why not get in touch and we’ll see what we can do for you. Fancy lilac or soft purple tones? Perhaps something blue? We’d love to see how we can bring your vision to life. 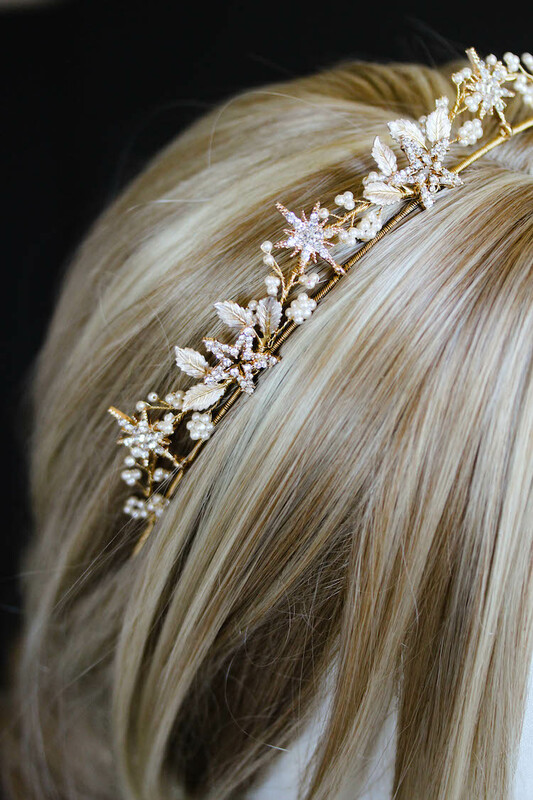 This dainty piece can be worn with or without a wedding veil, in half up hair or to adorn a bridal updo. The split comb system allows you to position a wedding veil in place and the headpiece on top for a look that’s seamless and effortless. You can simply remove the veil after the ceremony and wear the headpiece in your hair for the reception and evening festivities. Our wedding accessories collection can be customised to suit you, your wedding dress and your bridal hairstyle. If you love a hair piece or wedding veil and would like it altered to suit you, get in touch and let’s chat. We’d love to work with you to create a beautiful heirloom for your wedding day.